Prints have been made from the original painting. One hundred limited edition numbered and signed copies (about 60 cm x 60 cm) are available and sell for 450 kronor each. Every print is unique since the text on each copy has been printed by hand and every print contains red sand from Voi that has been mixed into the wet ink. The prints can be ordered by sending a mail to Jan-Åke Thorell. They can also be purchased at Format, Storgatan 2 in Ulricehamn. Ram o Hobby on Storgatan 12 and Byhlins Ice Cream on Dalgatan 3 are giving a 20 percent rebate towards framing and half goes to the Voi project. Björns Presenter Konst o ramar on Storgatan 2 is giving 10% of the framing costs to the Voi project. Cards are also available now. They are 15 cm x 15 cm with the same motif for 30 kronor a piece (including envelope). 10 cards cost 250 kronor. They are printed on the same quality paper and are double weighted. The cards have no printing on the inside, so they can be used for different purposes. The cards can also be purchased at Format. 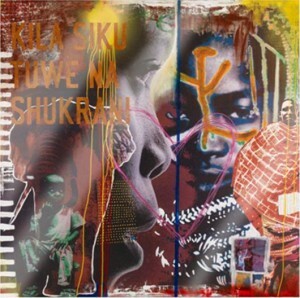 The original motif is a collage created with photos and patterns from Kenya. The photos were taken in Voi by Sune Broman, together with a few photos from old books about African tribes. The elephant symbolizes strength and what a collaborative project like Voi can accomplish through collective strength. The main design was created with a computer and then printed out on a canvas, which was then painted and blended together using various techniques. The red color in the painting was created with red sand that was brought in from Voi and mixed with paint. The graphic dots and stripes were common in Kenya before for everyday items and body paint in certain tribes. On the bottom right, you will find aerial photographs from an old atlas together with a register sheet from the same book where the city of Voi is also shown. For most of us, the first contact we have with the great continent of Africa is merely a picture on a map, a dot, a name, which we later expand on with our own experiences and memories. The text, “Kila siku tuwe na shukrani” is Swahili and is the last line of the Kenyan national song. Loosely translated, it means “Fill every heart with thanksgiving”. The painting is 2 x 2 meters. It was created and donated by Pär Johansson. It was sold during the Rotary Gala for 28 000 kronor to Hökerums Construction Company. One hundred percent of the profit goes to the Voi project and the orphaned children.